If you take road trips, boat or camp by yourself, then you probably take a traditional ice cooler along with your. Ice coolers are simple, but they are tedious to use and require constant refills of ice. Which also makes them heavy. Traditional ice coolers are also WET - you've probably opened yours to find soggy food more than a few times. An electric cooler, on the other hand, will keep your food dry, does not require refilling and carries more drinks and food than an ice cooler of the same size. There are two types of electric coolers: thermoelectric coolers and compressor coolers. 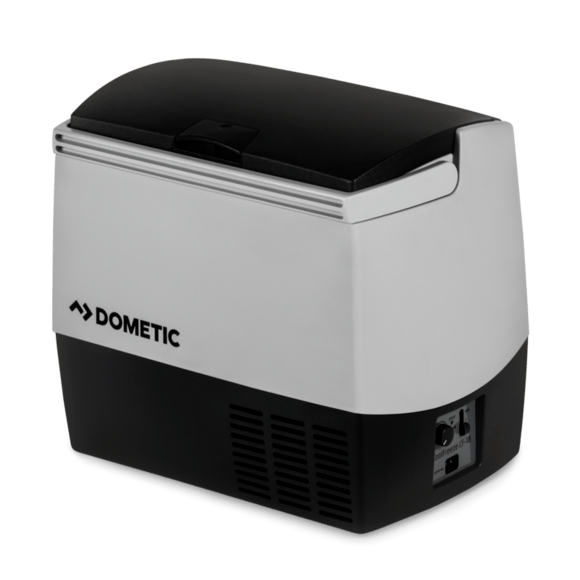 The Dometic CF-018DC Portable Freezer/Refrigerator is a single-person compressor cooler. This means it works the same way as your kitchen fridge - using a compressor and coolant. The upside of using an electric compressor cooler like this Dometic is that will keep your snacks cold or frozen no matter how hot it gets outside. Keep reading to learn why I think the Dometic portable electric cooler/freezer is one of the best 12V personal electric freezer-fridges you can buy today. This is the main advantage of a compressor-run electric cooler like this Dometic over a thermoelectric or traditional ice cooler is that you can use it to store frozen food or keep ice frozen. 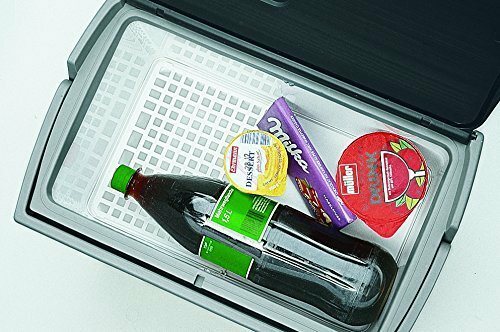 Unlike other portable coolers that have separate sections for the fridge and freezer, the Dometic CF-018DC only has one. The temperature dial is not calibrated, however, so you will have to do some trial and error to find the right temperature. Note that unlike some thermoelectric coolers, this cooler does not have a warming feature. You can only cool or freeze. 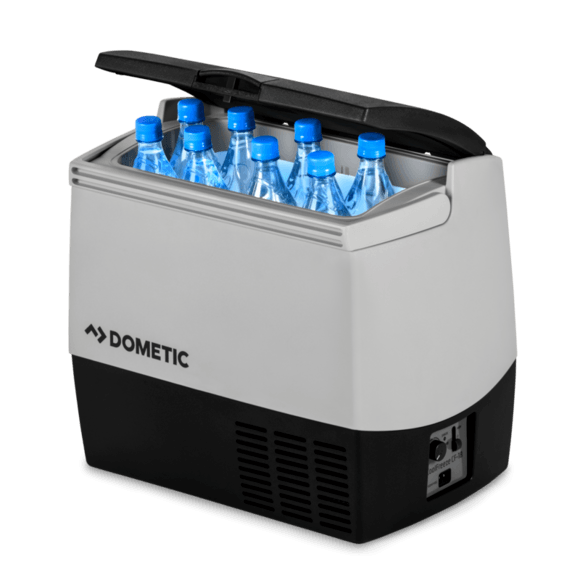 The Dometic CF-018DC uses a compressor to cool your drinks and snacks. It’s basically a miniature version of your kitchen refrigerator, complete with a refrigerant. wider temperature range: a compressor cooler can cool as well as freeze. not affected by outside temperature. You can travel with it anywhere and still enjoy perfectly-chilled or frozen snacks. cools faster. No need to pre-chill or pre-freeze your drinks and food. Go ahead and drop that warm six-pack inside... in an hour or so, you'll have cold beer. The main downside is the weight. As small as it is, this unit weighs 25 lbs - empty. The Dometic CF-018DC can maintain its internal temperature from an ultra-low 0 degrees Fahrenheit to as high as 50 F.
But as I mentioned, the temperature dial does not have any calibration. So you cannot set a precise temperature like 10oF or 30oF. It will take a few tries before you learn where to position the dial to achieve what you need. I recommend dropping a cheap thermometer inside if you really need to know the inside temperature. An electric cooler’s cooling capacity refers to the maximum temperature difference between ambient or outside temperature and inside temperature. Essentially, how cold can it get relative to outdoor temperature? Compressor coolers like the Dometic​​ CF-018DC can maintain their temperature regardless of ambient temperature conditions. So whether it gets really hot or really cold, the cooler maintains the set temperature just like your kitchen refrigerator does. In fact, some owners have used this Dometic electric freezer in temperatures as high as 100 F without problem. And in case you lose power, the extra-thick insulation prevents the interior from being affected. The Dometic CF-018DC cooler is not very large - it’s designed for one or two people. The 0.64 cu. 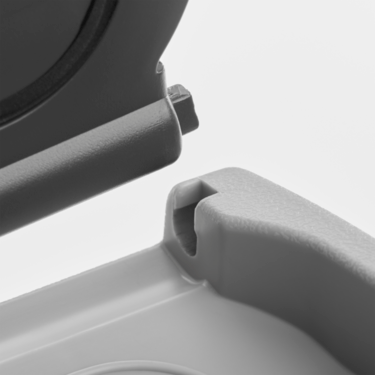 ft. (18 litres or 19.4 quarts) compartment can carry up to 23x12 oz cans. It’s large enough to hold a standard 2-liter bottle or a wine bottle on its side plus lunch for two. There are no shelves or racks inside – it’s too small for that. This cooler is designed to be carried by hand. It’s really compact, measuring just 18.3” long and 11.8” high and weighs 25.4 lbs. Of course, it will be heavier when packed, but you can move it from the car to the camping or picnic spot with ease using the plastic handle on top. You’ll also have no trouble finding a place to place this unit in your car. It fits easily in between front seats of any vehicle, so you don’t have to stow it away in the trunk. A 12V or 24V DC outlet is needed to power this cooler. Most people plug it into a 12V cigarette lighter. Depending on your vehicle's battery capacity, you can run the cooler for several hours with the engine off, because it doesn’t run the compressor all the time. It's insulated well and only kicks-on when the temperature dips below a certain point. Just to be safe, this Dometic Cooler-Freezer comes with a battery monitor that will shut off the unit if it detects low voltage in your vehicle's system. If you’d rather not risk draining your battery, then consider getting a portable solar charger or a portable generator with DC output. There is no AC or USB charging option, unfortunately. If you want to power it with an AC outlet, you’ll have to buy a converter. Note that this cooler does not have a battery backup option. You want a personal portable cooler you can use in your vehicle or boat. You sometimes need a freezer, too. 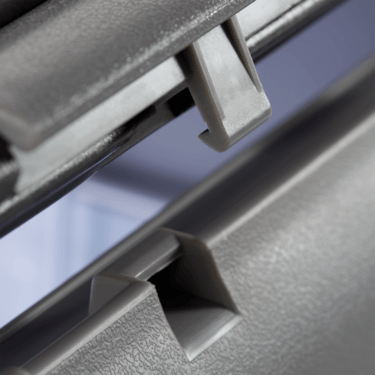 You live or travel in hot climates - including the inside of your car.